David Hasselhoff CD Reviews on Amazon - Absolutely Hilarious! 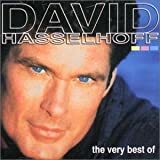 This is the link to customer reviews of the Best Of David Hasselhoff CD on Amazon. Word is getting around the web that users should write "Ironic" reviews of his albums. The reviews are absolutely hilarious, especially from one star reviews not in on the gag...! Ironic David Hasselhoff CD Reviews on Amazon - Hilarious! From Knightrider to Baywatch to the Berlin Wall to SpongeBob, David Hasselhoff is a man of many talents and the leading US music artist in Germany. Fans of "Der Hoff" are therefore paying homage and leaving "5 star" reviews on Amazon. These ironic reviews will bring you out in tears... of laughter!! !